I've always loved the little toys with surprises inside, so when I found a mysterious box were you could find a diamond or a pice of gold inside, I couldn't resist to try luck with my little one, you never know if this would be your lucky day! The two piece I tried were from two different brands, the Dig a Diamond (by Science by Me) and Dig Gold (by Mine It). Both toys are for children older than 6 years, so when I used with my little one (he is just 30 months) I was all the time checking him. The tools could be dangerous without adult supervision all time and the sand could be toxic to eat, so if you try these toys with your little ones, keep them vigilant all time! 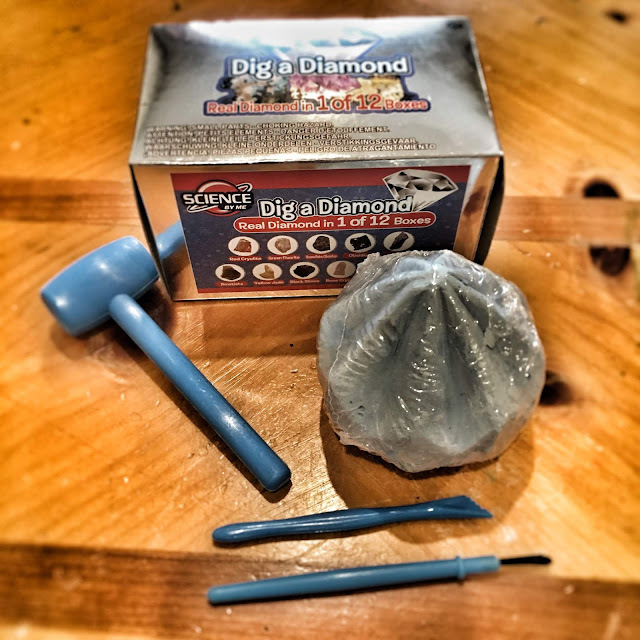 We started with the Dig Diamond, the tools were perfect for little hands, but I missed a magnifying glass to show my little one the mineral inside. 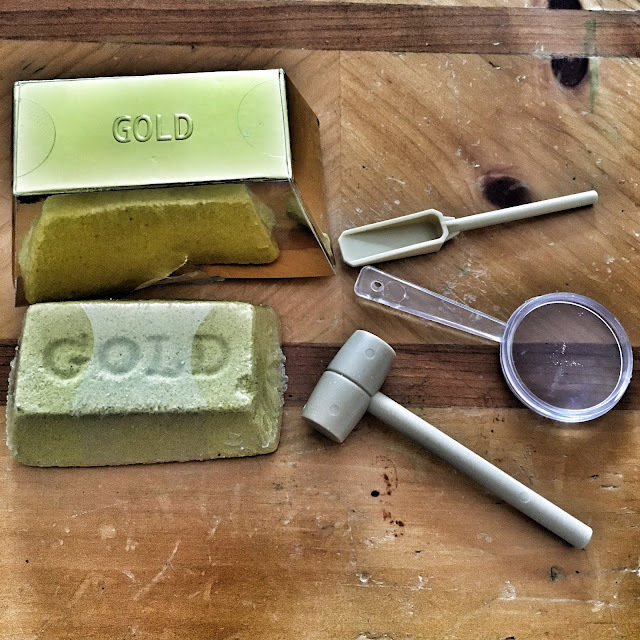 The Dig Gold was easier to dig, it just took a few minutes to find the mineral and it was fun! The tools were great, small size for little ones; but a chisel for the hammer would had been better! As you can see, I didn't find the precious prize, but we did had a great time trying it! 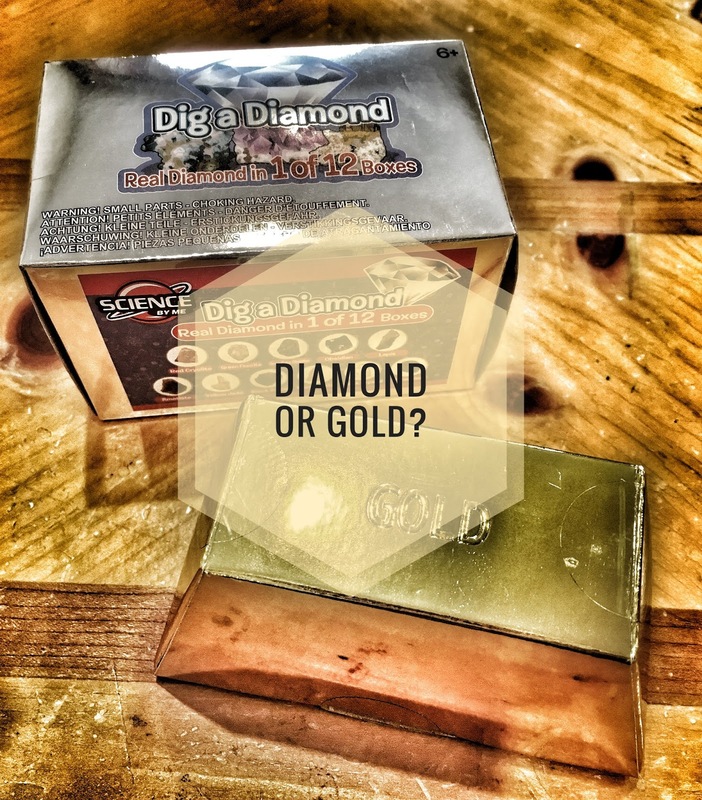 After playing with the two brands, I liked more the Mine It brand, it was easy to find the rock and the mineral was much better than the other one!